avec la fleur: beach blanket bingo! 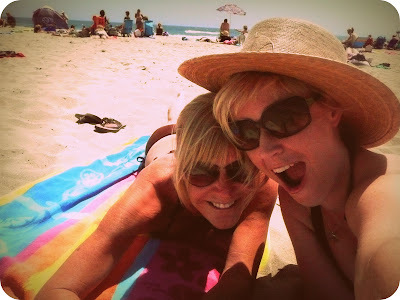 my mom and i went to the beach yesterday! it was really nice. it's the first time i've been this year! we just ate strips, talked, and laid in the sun. ...not that laying in the sun really does anything for me since i coat myself in spf 70 (i had to tint these photos a bit to keep from blinding you all). it's really hard to have an esthetician's license (not to mention parents who have had melanomas cut off their bodies) and not be super sun-conscious! I love the ocean! What an awesome day! Beach time with your mom! :) priceless.. Your mom is wearing a bikini!!! wow you have good genes. Not to mention you look super hot in your suit and sun hat!! :) I just love the beach! Ahhh! The beach! Can I come and hang out with you by the ocean? I love it. Loving your beach attire...that hat is fab! I agree on the sunscreen! It's just not worth it! PS-you look great in that suit! amen to spf-usage! my man has had numerous melenoma spots removed & he is 26(today actually is his bday). spf 70 is the way to go. (tinted mousterizers!) love your suit! Good for you spreading the spf love! I wear spf 15 on my face at all times, day or night, December or August. And when I'm out in the summer sun, it's spf 70 all the way. If I make it without a tan line, I've had a successful summer. mmm, 3 fist pumps for sun protection! My dad had skin cancer, so I can appreciate it too! Although, every time I buy a new sunblock, I lose it. So, I've been without lately. I'll probably end up looking like a leather handbag when I get older if I don't start using avidly again! you're just super smart. own it :) i love beach days. Aw, lookit you two cuties! Both gorgeous, obvs. I am the same way. I usually sit under an umbrella. Your mom is waay too cool. My mom freaks out when I wear a bikini -.- haha! I wish my mother wasn't so busy and stressed all the time -- it would be good to spend time with her where she wasn't rushed. I want to live near the beach ! :) How lovely. Ah I miss the beach. Can you believe I lived in El Segundo for 2 years and only went to the beach like maybe 3 times. I miss it. That last photo of you is stunning. So lovely and like from a magazine ad!